Dynamic and Highly Absorbent Clean-up Tool, Also Functions as a Containment Device and Prevention Tool. There are two main applications for the SPILL CLEAN-UP SOCK: daily maintenance use and emergency response. For daily maintenance, the sock fits snugly against machine bases and wraps around corners, keeping the work area safe and dry. But it is also very efficient in controlling spills in an emergency. The SPILL CLEAN-UP SOCK will absorb, block, and confine in emergency situations. Easy to handle and saves time in the first critical moments after a spill occurs. Begins wicking or drawing up liquid fast and retains it. Reduces surface area of spills which results in a faster clean-up. Excellent diking and damming - ideal for spill containment in emergency situations. Hugs the floor, creating an effective barrier or dike that holds back fluids even after total absorption. Flexibility of the Sock allows for positioning around any machinery, corners, and curves to contain and soak up oils, inks, solvent and chemical spills. 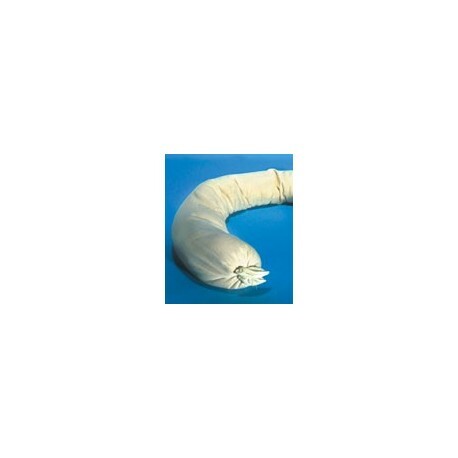 Highly absorbent, it will hold up to a half gallon of UV material. As long as it is in contact with fluid, the Sock continues to absorb without being turned over. The sock is a self-contained absorbent. No messy clean-up - just pick up the old one and put a fresh one down. No loose absorbents to spread, sweep, scatter, shovel, and track around. Light in color. This allows easy visual observation of amount of fluids absorbed. High-efficiency absorbent. A little goes a long way, reducing purchasing and disposal costs. The Spill Clean-Up Socks light weight means lower shipping costs and its easy to carry. Consistent size means you get what you pay for every time absorbency and size remain constant. Measures 42"L x 3"D. Sold individually.